Quality medical furniture and lighting are crucial aspects to any successful medical office. Foremost Medical Equipment has been an industry leader in medical equipment and repair for more than 13 years. They understand the crucial roles the right furniture and lighting fixtures play in a clinical environment. Here they discuss four essential pieces of medical furniture and lighting to make your practice more inviting, comfortable, and pragmatic. A blood drawing chair needs to be both comfortable for the patient and a functional workspace for the technician. The Brewer Model 1500 is an ideal choice for any lab setting. Made of sturdy, resistant materials and a two-inch foam cushioned seat, this blood drawing chair comes with two add-on work surfaces and an optional drawer for storage. 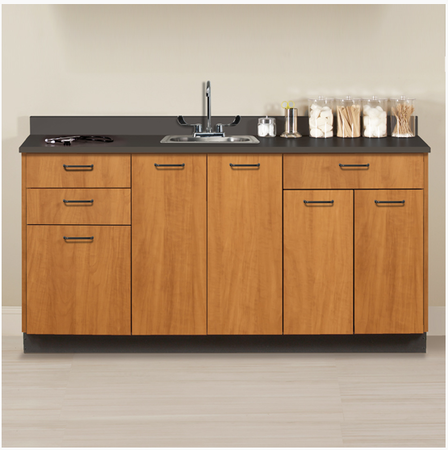 With an abundance of storage space and a large, easy-to-clean laminate countertop, the Clinton Industries Base Cabinet fits effortlessly into any medical office. It's easily customized as well: you have several options for the countertop, frame, door and drawer, and door and drawer pull colors. Foremost Medical Equipment offers this unit at $450 off the retail price. This multipurpose light expertly illuminates any medical work area. Built on wheels for easy transport, the Bovie Medical MI 500 Head, Arm and Floor Mount Kit works with LED lights from the MI 500 series. Foremost Medical Equipment also sells many other Bovie Medical lighting fixtures. Welch Allyn has long been a trusted name in quality medical equipment. The Green Series 300 Table/Wall Mount LED White offers a single bright examination light that never needs replacement. The wall mount means more floor space, and the LED light means you’ll reduce your environmental impact—to name just two of this unit's exceptional features. The furniture and lighting in your medical office serve both practical and aesthetic purposes; make sure you're offering your staff and patients the very best. Call Foremost Medical Equipment at (585) 586-4880 to order any of these medical essentials. You can also visit their website to learn more about their products—from patient monitors to defibrillators, they offer a comprehensive inventory. Want to receive more tips on finding the medical devices and supplies your practice needs to succeed? Connect with Foremost Medical Equipment on Facebook and Twitter today.